Ride up to the summit of Mount Diablo on North Gate Rd and enjoy the magnificent mountain top views along the way! Mt Diablo State Park North Gate Entrance Station to the Junction Ranger Station is 6.5 miles with an average grade of 6%. There is a steep 9-11% climb from Toyon Picnic Area to Grapevine Picnic Area; the road eases up from Grapevine Picnic Area to Juniper-Diablo Valley Overlook. 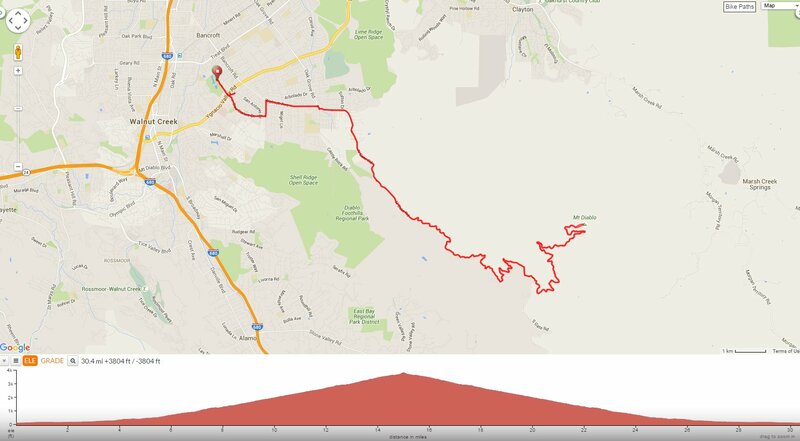 Devils Elbow to steep 13-17% climb up “the wall’ to Mt Diablo Summit. Mt Diablo summit-enjoy the views! Climbing up Mt Diablo to the summit is one of my favorite Bay Area rides-the mountain changes with the seasons and the views are spectacular! Weather: Sunny and warm with temps ranging from the mid 60’s to the mid 80’s with NW winds. I was on the mountain last Friday. Even with the haze, such a perfect place. Your riding all my favorite places, East bay and Marin, and I’ve missed your locations sometimes by hours. Thanks for all that you do with the Chronicles! You’re welcome Rich! Hope all is going well with you-we’ll need to coordinate for a future meetup!